Only one Easter House made this year, but I am very pleased with it. Some things force you out of your comfort zone and this one did. How? It made me use a different color palette – a bright Springy, happy palette that I happen to love. None of that grey, black and blue Halloweeny palette here. I made this house for one of my friend’s grandkids. 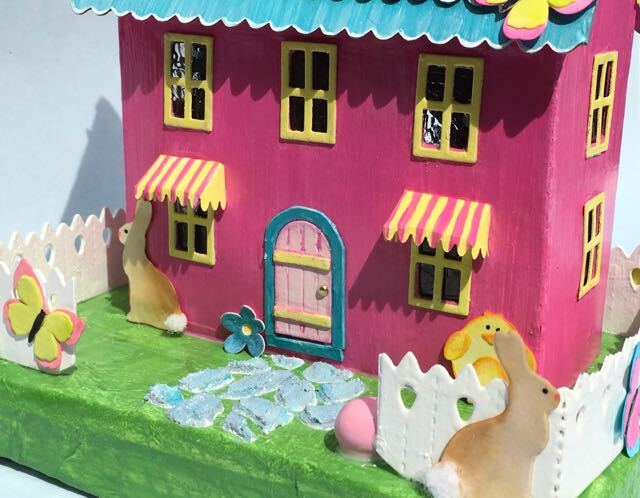 Sharon said that 2 of her granddaughters noticed my Easter houses on her Facebook page and just went crazy over them. She told me that the little houses have been the topic of conversation every day since then. Well, of course, I must make one for them. 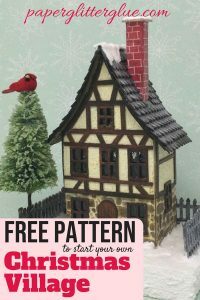 The basic house is a plain house with gables on each end which was left over from my Christmas Little House Making Party. That was easy. And it’s probably not a surprise, but I just received the new Tim Holtz Village dwelling die set which is affectionately called Village Renovation. It’s a set of dies that includes 5 window frames (Hurrah! We can cut out 5 windows frames at a time! ), a bay window, awning and the cutest door design. 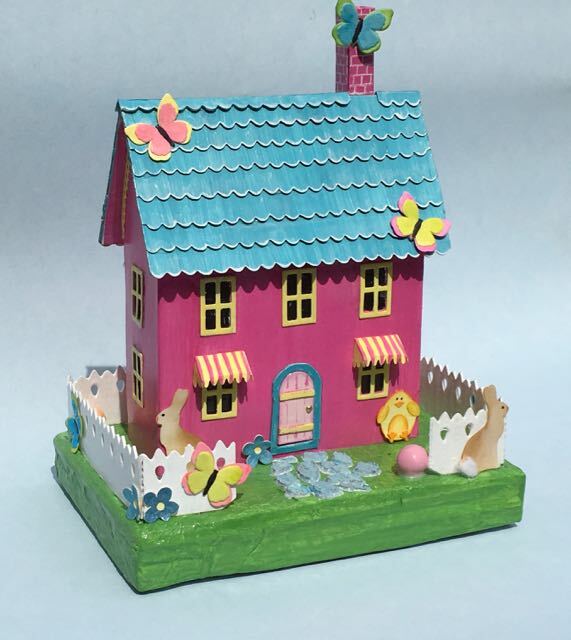 Perfect for this little Easter house. I knew how I could use them on the house right off the bat. Sharon likes purple and I debated about purple, but that color did not inspire me. What about pink? I know she likes pink, too. First, I painted the house with the pink Spun Sugar distress paint, but to my eye, it was a little pale. What about Picked Raspberry distress paint? Yes, that is perfect. And what about a really great blue to complement it? My go to blue is Tumbled Glass, but if Spun Sugar pink is too pale, then Tumbled Glass blue is also too pale. Broken China in the distress paint line is the perfect blue to complement the raspberry color. I love it for the roof. Mowed Lawn distress paint is my favorite green for the springy lawn laced with bunnies and eggs and chicks. Also, the white picket fence shows up so nicely on this green. And finally, for accents on the house I used Squeezed Lemonade for a beautiful pure yellow. That completes the color palette for the Easter house. Now we’ve got the colors down. It’s time to build on the house. The door die in the Tim Holtz Village Renovation set is wonderful. It has all sorts of potential. I did use the Spun Sugar pink color for the door to differentiate it from the deeper color pink on the rest of the house, but I highlighted it in Picked Raspberry on the edges and used yellow cross pieces. A small gold brad is the door knob. To make the door pop, I used the frame of the cardboard where the door had been cut out. I knew that would fit easily around the door since the door had just been cut from it. I cut around it to make the door frame and painted it with Broken China as well. The window awnings are made from thick cardstock paper painted Squeezed Lemonade yellow with Picked Raspberry stripes. The awnings tickle me. What a cool effect. All the windows were glued on with tacky glue. Now a bit about the roof. Since I was kind of in a hurry, I tried to just paint the roof and leave it at that. The problem is that this house has a very steep roof and visually the roof occupies a lot of space. The large expanse of Broken China blue looked boring to me. I had to break it up with some shingles. This house is just over 5 inches wide so the 3 inch Village Rooftop dies would require a lot of piecing to cover the roof. There is another option using a different die that is just over 5 inches long – one of the Tim Holtz “On the Edge” dies – Mini Scallop and Pinking. It’s perfect for roof shingles on a house this size. So I cut out about 20 strips of cardboard, painting them with the Broken China blue shade. Before I fell sleep I imagined how the blue roof shingles would look and decided that each shingle needed to be edged in white. I have recently discovered white gel pens, specifically Uni-Ball Signo White Gel pens and they are so fun to use. 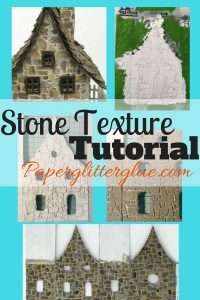 I actually edged all the shingles in white TWICE because when I painted over them with Mod Podge to seal them, it dissolved the gel which meant I had to do it again. 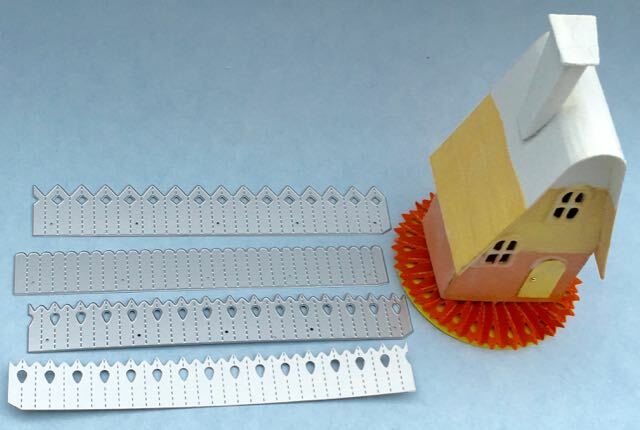 Here is an example of the rosette die being used as a rosette for the base of a Candy Corn house, but when it is laid out it looks like a picket fence to me. See the cutout piece on the bottom. Doesn’t that look like a fence to you? The fence is another feature I am tickled about. Recently I purchased another set of dies to make rosettes, but to me they look like fences as you can see in the photo. I cut the pieces out and made fences with them. It was so easy because they were long enough to go around the house without adding posts or gluing sections together. Nice. Naturally, the fencing is colored with Picket Fence distress paint. 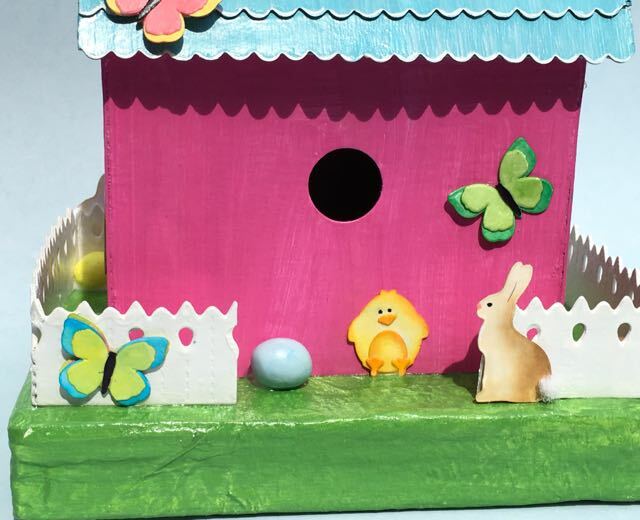 Bunnies and eggs and chicks and butterflies are the main decorative elements for this Easter house. 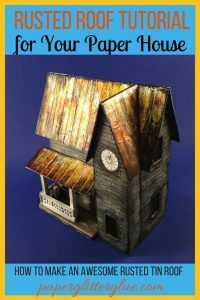 They are made from one of the Tim Holtz Sidekick dies. The egg is just polymer clay rolled into an egg shape and baked. I made bunnies and butterflies and chicks from another Tim Holtz Sidekick die for a shadow box called Hello Spring! These are the perfect size to decorate the Easter House. I glued them on the roof and the chimney, at the base of the house and on the fence. I love these little characters. And how could you build an Easter house without Easter eggs? These eggs are simply bits of various colored polymer clay rolled in an egg shape. Be forewarned though, if you put Easter eggs around a little cardboard house, children will be compelled to touch them and perhaps try to pull them off because they look so much like candy. I squirt a large blob of glue to embed the eggs in to try to prevent the eggs from being pulled off before an adult can intervene. The final detail that I added was the stone walkway. The house just looked a little unfocused without a walkway leading to the door. My standard way of making a walkway is to use a stone-shaped stencil with texture paste and then paint it in stone-like colors. I made this one using more pastel colors to match the house better. 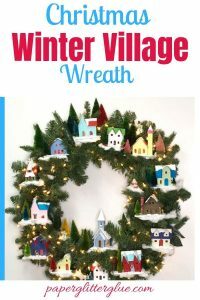 When I make a house knowing that it is going to children, I try to reinforce it with extra glue and a coating of Mod Podge. That makes sure that the shingles are glued down, the paint colors are protected and adds a little bit of water resistance. I always coat the bottom as well in case somehow it gets exposed to water on the bottom. The house is not waterproof, but it has a bit of protection. This is not my usual process for making a little cardboard house. In fact, it was the opposite of my usual creative process. Normally I design a house plan and make siding choices and think about the base long before I choose colors, but since this is for 2 younger girls (8 and 10 years old, I think) and I was kind of in a hurry to get it done before Easter, the color palette informed all the other decisions. Despite the backwards design process, I am very happy with this house and I will make another one working from the colors to the design in the future. Thank you for stopping by. Let me know what you think about this little house. 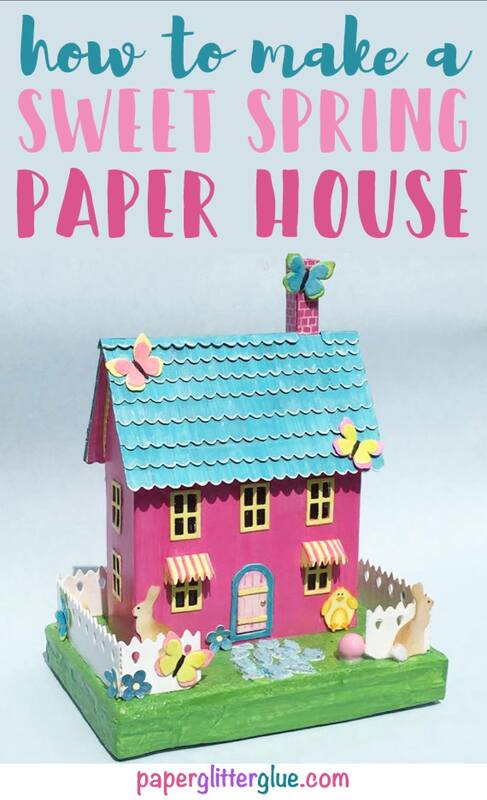 Do you have any specific ideas for another Easter house? I am always looking for ideas for little houses. I hope you have a wonderful, loving Easter weekend. Hi Lucy! 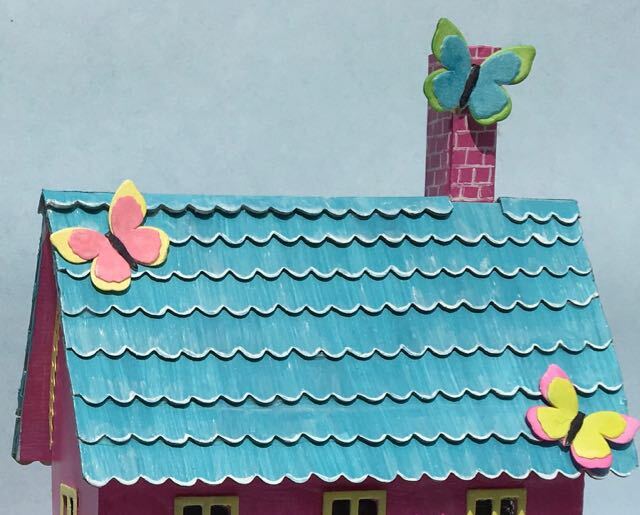 This Easter House is so colorful and sweet – I am sure the two young girls will love it. The awnings are my favorite feature! So cute! Great job with all the colors and I love the white pen for trimming the shingles. Such nice work. Happy Easter! The girls will love this! Your new website is so professional and the name is so, so good. Happy Easter, my friend! Thank you. I am working on my blog and I appreciate that you even noticed. And the blog name is so much easier to remember when I tell people about the blog. Readership is lagging, but I am working on that as well. this is adorable, so many awesome details! I am so glad you played along with us at simon says stamp wednesday challenge! It’s so much fun to step out of your usual and refresh those creative juices. I can tell you had fun with this house, which inspires the rest of us. No youngster for me to make this for (nephew is 25 and no grands in the near future) so I’ll just have to make this for me.